Product categories of Diamante Sandals Trim, we are specialized manufacturers from China, Diamante Sandals Trim, Women Sandal Trimming suppliers/factory, wholesale high-quality products of Sandal Trim R & D and manufacturing, we have the perfect after-sales service and technical support. Look forward to your cooperation! 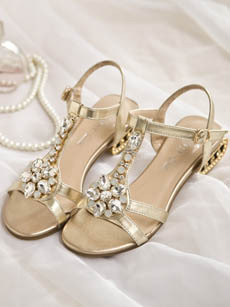 Diamante Sandals Trim Are Widely Used For Women`s Flip-Flop Summer Casual Shoes. They Have a Base That Is Molded Out of Some Sort of Metal, Sometimes Gold or Silver. These Sandals Trim Adorned With Different Grades of Diamante, CrystalsThat Are Either Glued On Or Soldered to The Base Metal. Usually Use Pearls, Glass Stones or Acrylic Stones Which are Either Sewn Together to Form a Specific Shaped Chain Pair. 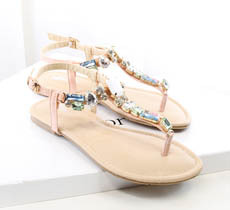 Diamante Sandals Trim With its Classic and Feminine Design is Really a Lovely Choice for the Bride or Mother of the Bride.These magnetic diamante Sandals Trim Featuring Colourful and Glass Stones areGreat Wayto Dress up Bride Wardrobe. Adding one of These Splendid Creations to Give Their Look at The Special Day and Bring a Little Extra Twinkle to Their Day. So Whether You Are Seeking a Vintage or More Contemporary Style, This Intricate Diamante Sandals Chain Pair Will Add a Bold Statement to Your Look.